Light/dark transition test is carried out in order to assess anxiolytic behavior. Light box (20x20cm; white wall) and dark box (20x20cm; black wall) are connected by guillotine door (see picture). Latency for first entry into the light box and time spent in the light box are index of anxiety. Open-field test is carried out in order to asses spontaneous activity in novel environment. 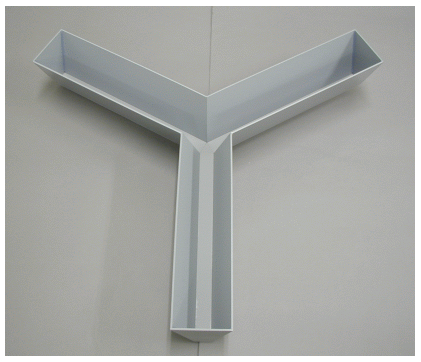 The open-field apparatus is made from polyvinyl chloride board (40x40x32cm, see picture). Distance traveled and % time spent in center area for 20 min were measured using CCD camera and video imaging system as indexes of locomotor activity and emotionality. The apparatus is consisted of three chambers as shown in left photograph. 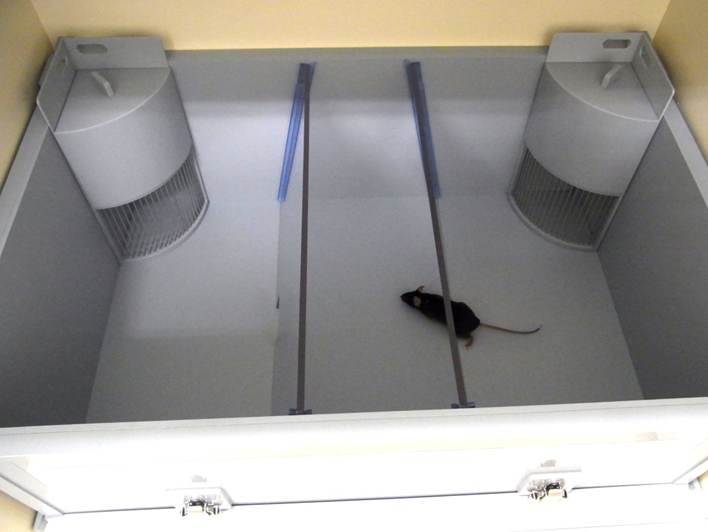 A novel mouse or novel object are placed in a wire cage at the left or right corner. Duration for exploration of the novel mouse or the novel object are measured. Home cage activity test is assessing spontaneous locomotor activity and activity pattern in the home-cage. Mouse activity measurement hardware system is assembled from magnetic field change detectors, data collection boxes, and PCs. Activity counts under 12h light/dark cycle (08:00-20:00 on) are measured for 5 days . 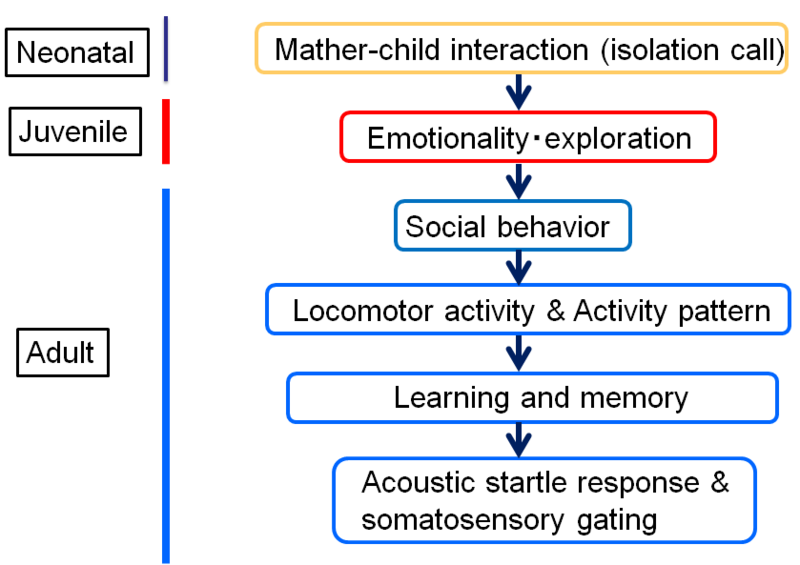 Locomotor activity, persistence (restriction of interest), spatial learning and memory. Apparatus of Y maze is consist of arms which lengths are equal as illustrated in left photograph. 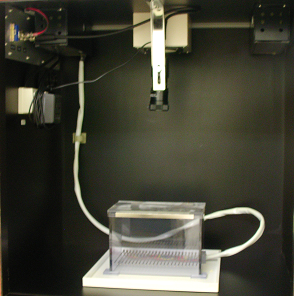 A mouse is put into center of the apparatus. Spontaneous locomotor activity, number of entry into each arm, and alteration ratio are measured. 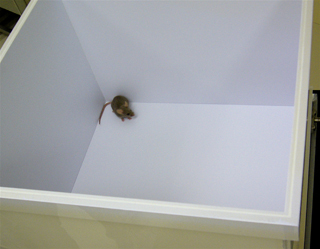 The contextual and cued fear conditioning test assesses the ability of mice to learn and remember. Prepulse inhibition (PPI test) is generally used to examine dysfunction of sensory motor gating system. PPI is a neurological phenomenon such as weaker prestimulus (prepulse) inhibits the reaction to a subsequent strong startling stimulus (pulse). In this test, acoustic sound was used as prepulse and pulse stimuli. 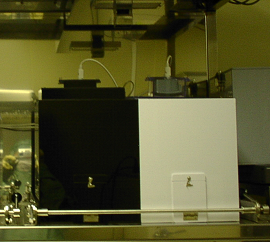 The mouse is placed in the plexiglas cylinder fixed in the sound-attenuating chamber. 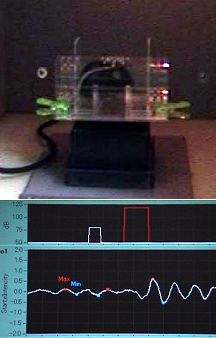 The peak amplitude of startle response immediately after the sound is recorded by the startle monitor. Prepulse inhibition (%) is calculated as following, (amplitude of startle response to pulse without prepulse - amplitude of startle response to pulse immediate after prepulse) / amplitude of startle response to pulse without prepulse x100.